Remember when we said Tepco has lost all control of Fukushima? We weren’t joking. #TEPCO: “It can’t be denied” there could be several fresh radioactive water leaks at #Fukushima-1. Doses up to 1800 mSv/hr detected on site. “This is what we have been fearing,” said Shunichi Tanaka, chair of Japan’s Nuclear Regulation Authority, answering questions about the leak at a news conference. “We cannot waste even a minute” to take action. 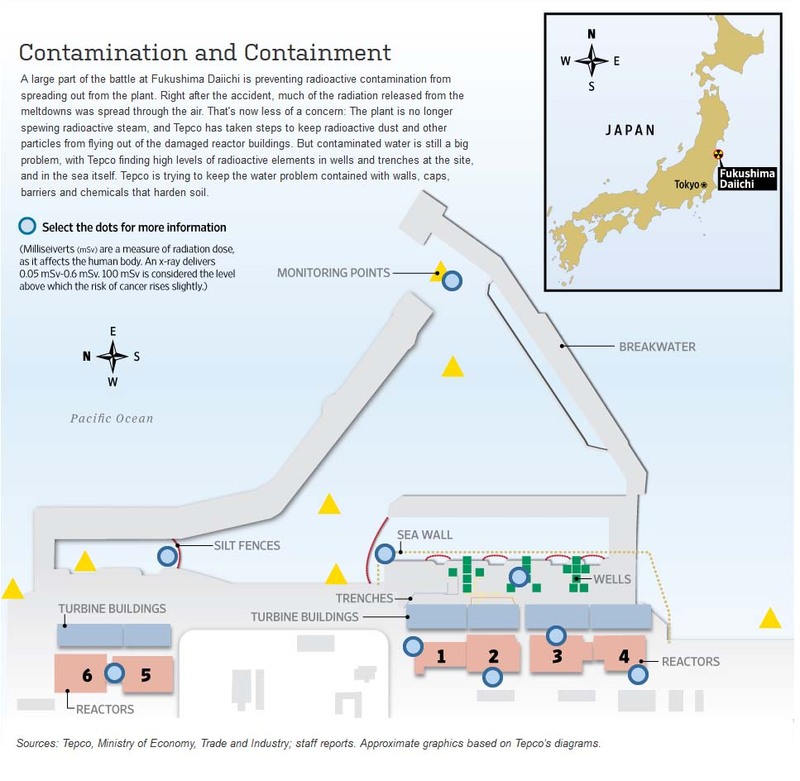 Every day, the utility has to find a place to store around 400 tons of contaminated water that it pumps out of the radioactive reactor buildings, and Wednesday it warned that it is fast running out of space. Storage tanks set up on the fly during plant emergencies have started springing leaks, and Tepco can’t replace them with sturdier ones fast enough. 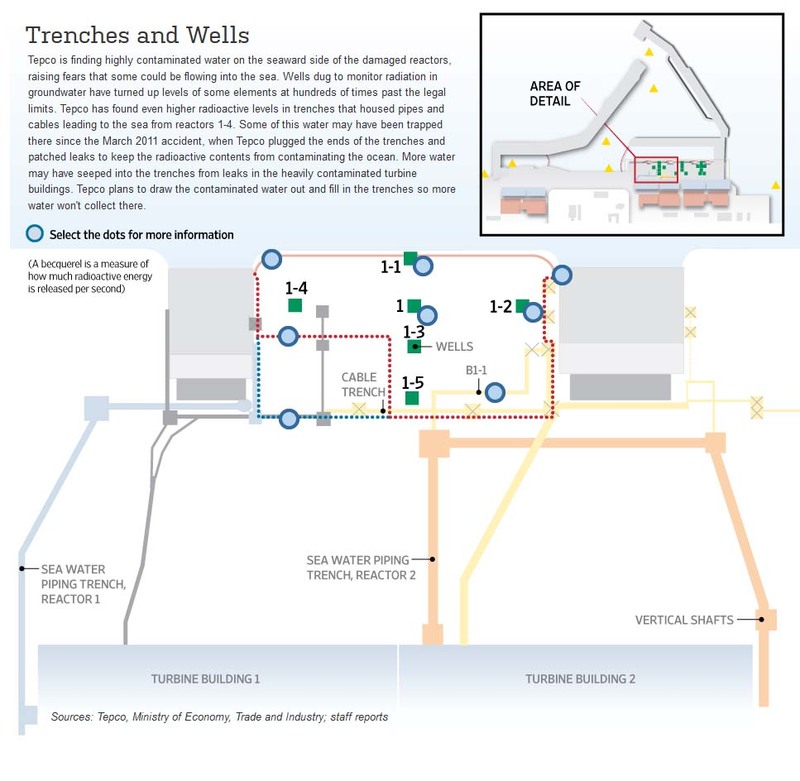 Groundwater-contamination levels are spiking at the seaward side of the plant, and water is flowing into the ocean past a series of walls, plugs and barriers that have been flung up to impede its passage. What does “losing control” mean in practical terms? 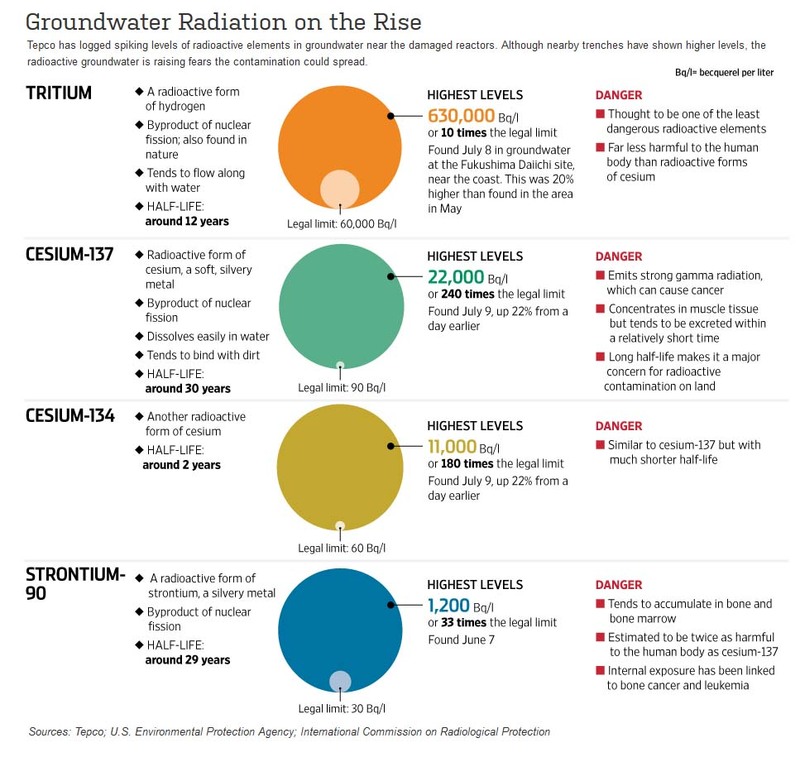 So far, the levels of radioactivity that have escaped to the outside remain relatively low, but some experts warn they may not stay that way—particularly as equipment ages and the heavy-duty work of dismantling the damaged buildings and removing the melted fuel rods proceeds. 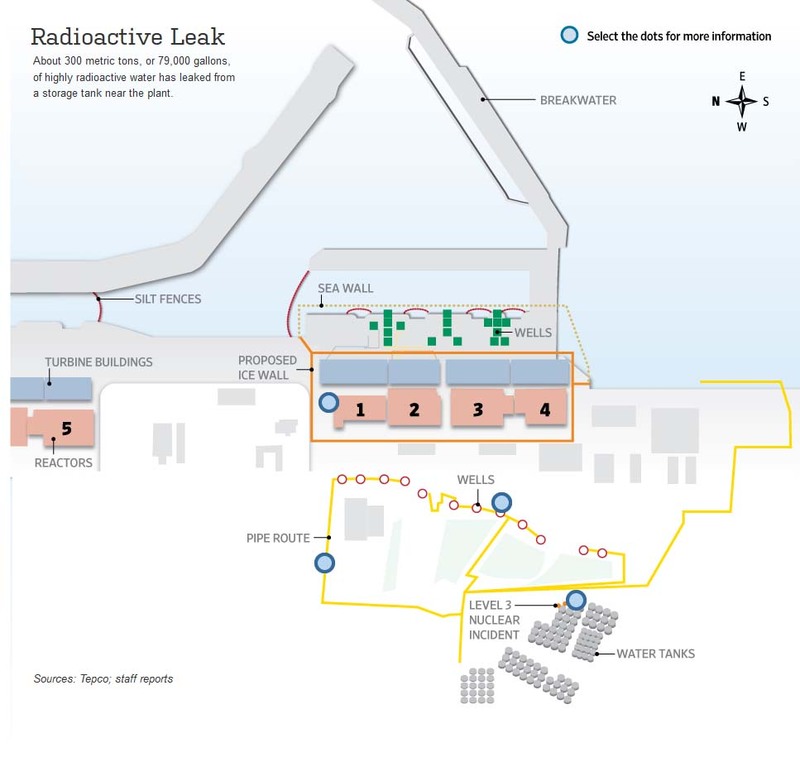 The radioactivity of the water in the most recent leak was so high that workers couldn’t get close enough to search for the cause until the remaining fluid in the tank was removed. The last statement bears repeating: “it is still not clear where the melted fuel cores are.” Well as long as TEPCO is 100% confident there are no uncontrolled chain reactions taking place… Then again hundreds of tons of coolant must be cooling something. Indeed the “worst-case scenario” is an appropriate topic because as covered here over the weekend, it involves the potential death of millions of largely oblivious Japanese citizens. As for the long overdue mea culpa by a nationalized TEPCO, which also speaks for the entire Japanese government, it sounds hollow at best and makes one wonder what else is left unsaid. Mr. Marui and others say the biggest reason for the scramble now is that Tepco—and the government bodies that oversee it—weren’t planning far enough ahead and waited too long to respond to problems they should have seen coming long ago. In an inspection carried out following the revelation of the leakage, high radiation readings – 100 millisieverts per hour and 70 millisieverts per hour – were recorded at the bottom of two tanks in a different part of the plant, Tepco said. The bottom line, and what has become painfully clear, is that Japan simply can’t fix the problem. Even China has now figured it out. China said it was “shocked” to hear contaminated water was still leaking from the plant, and urged Japan to provide information “in a timely, thorough and accurate way”. What is strangest of all is that the Japanese people are far less concerned about the government’s cover up. Oh well: they have their distractions – like a plunging currency, and (transitorily) soaring stock market, in nominal terms of course.